Finally, a favorite writer for the letter И! I’ve had a collection of Fazil’ Iskander’s stories on my shelf since the ‘90s but never seem to want to pick it up... But Iskander’s Детство Чика (Chik’s Childhood) drew me in right away because its stories are connected by characters: a boy named Chik who’s finding his place in the world, his addled Uncle Kolya whose fishing tackle lacks a hook, and a group of neighborhood boys and girls. I read three of the pieces in the book and particularly enjoyed the longest (of course! ), Ночь и день Чика (Chik’s Night and Day), in which Chik has trouble sleeping at night – he thinks about fears, like scorpions – and then goes on an expedition with his friends the next day to harvest pine sap to make into chewing gum. Iskander’s writing is simple without being simplistic, and his observations about childhood create in Chik a vivid portrait of a boy who can be generous with other children, including a child teased for his disability, but sharp in his judgments. When Chik thinks about adult sneakiness, he reminds me of a young, Abkhazian Holden Caulfield. I think what I enjoy most about the Chik stories is that Iskander presents a balance of information about Chik’s life and surroundings, including references to Chik’s knowledge of sociopolitical problems of the Stalin-era, like the arrest of a neighbor girl’s father and talk of wreckers, together with the childish joy of the pine sap adventure. That outing is fraught with hazards, too, like a band of neighborhood boys and a biting dog. In our era of play dates and safety, I’m sure many parents would disapprove of kids starting an outdoor fire to boil their pine sap! I should mention that I also loved the portrayal of Chik as a proud child actor – Chik does not lack in self-confidence – who gets demoted from a lead role to a nonspeaking role in “Чик и Пушкин” (“Chik and Pushkin”). I’m setting Chik aside for now, saving the rest of the stories to read another time. By the way, according to Wikipedia, at least eight volumes of Iskander’s work have been translated into English. As for other И/I writers… I enjoy Il’f and Petrov, particularly The Golden Calf (previous post), but they’ll never be favorites. And I thought many passages in Aleksandr Ilichevskii’s Matisse (previous post) were very good but the book didn’t quite held together for me. Ilichevskii’s Persian is on my shelf waiting (or weighting, since it’s thick?) for a second try. I’m hoping Ilichevskii’s listing on the Academia Rossica Web site means he’s one of the 40 (!) or so writers who will be at the London Book Fair in April. I always enjoy recommendations on my alphabet favorites posts, so look forward to reading comments! Up Next: Mikhail Gigolashvili’s Толмач (The Interpreter), which I enjoyed very much; I may need to add Gigolashvili to my Г/G favorites page. Then Olga Slavnikova’s Лёгкая голова (which I think I’ll call Light Headed, at least for now), a curious book about a brand manager at a chocolate company who is approached by government agents with a strange proposal. Image credit: Abkhazian commemorative coin celebrating Iskander’s eightieth birthday, from Bank of Abkhazia and Sephia karta, via Wikipedia. Ah, paranoia! 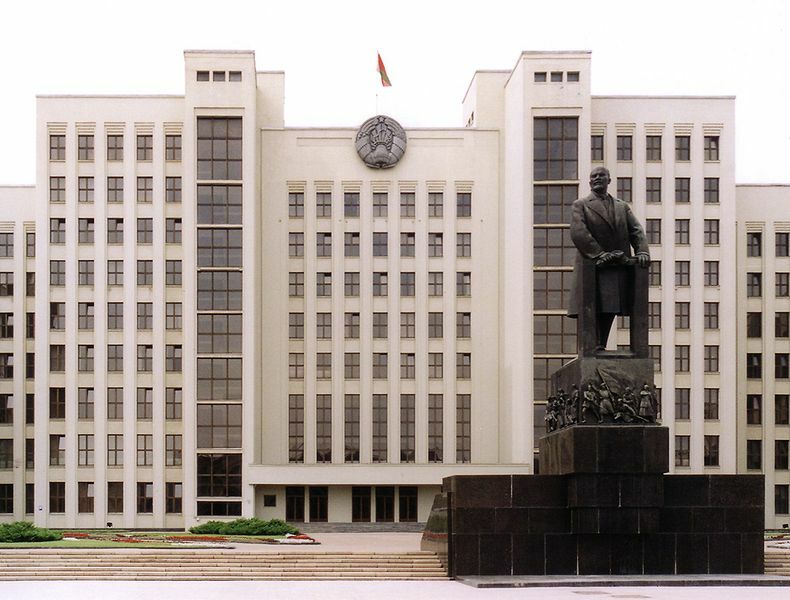 Ah, Minsk! Viktor Martinovich combines the two in Паранойя (Paranoia), an absorbing but not-quite-satisfying novel about life in a Belarus run by the security ministry. Paranoia is a mashup on several levels: Martinovich calls his genre mix “reality antiutopia” and says fear is the main character, though I’d probably call it a police state love story with documentation. Martinovich scatters in references ranging from Lewis Caroll’s Alice to Dante’s “Abandon hope all ye who enter here” to a line from The Matrix to the Marks & Spencer name. And so on. On the simplest plot level, Paranoia is a boy-meets-then-loses-girl novel: Anatolii Nevinskii, whose last name means “innocent,” meets Liza in the Chess coffee shop. She likes latte macchiatos, parks her Lexus SUV illegally, and tells Anatolii she’s been waiting for him all her life. Anatolii, a writer published in the West who drives a BMW he calls his frau, is smitten. They take a walk in the park. A romance ensues, and they rent an apartment in which to meet. The love nest is bugged, and the middle of the book is transcripts of listening sessions, with some analyst commentary that made me laugh. Our lovers, by the way, are code-named Gogol and Lisa (лиса/lisa in Russian means fox). Liza isn’t any old poor Liza from Russian literature: she’s rather well-to-do, thanks to security minister Muravyov himself, who’s given her real estate and cars. Their relationship isn’t quite clear but when Liza becomes pregnant, she tells Anatolii that Muravyov may be the father. Romance in a dictatorship – particularly when the dictator is one side of a triangle – involves lots of people and no privacy. So: End of romance with Anatolii. And end of Liza: she disappears and Anatolii becomes a suspect. Descriptions of the Liza-Anatolii relationship weren’t very interesting, perhaps because they reminded me so much of the romance in Olga Slavnikova’s 2017 that was also intended to be illicit and mysterious. Like Slavnikova, Martinovich employs a sea of metaphors at the start of the book, most memorably comparing used condoms at the park to jellyfish. Paranoia’s characters felt both hyperreal – the bug transcripts are oh-so voyeuristic – and abstractly hollow, with Liza seeming to represent some desired post-Soviet Feminine and Anatolii and Muravyov seeming to represent some yin and yang, two sides of the same coin, or similar cliché for complementary opposites. Liza, by the way, sees a kinder side in Muravyov and likes hearing him play the piano, particularly Mozart’s 24th piano concerto. Even Anatolii admits, after hearing Muravyov perform the concerto at a concert, that the maestro’s playing is sincere. It’s difficult to explain why Paranoia disappointed. The ending, with Anatolii’s state-induced retreat to a combination of fantasy and his new reality, felt inevitable after talk about how “they” control people, but the last pages felt weak, easy, and indefinite. More disconcerting were long passages about love – we already know Anatolii’s in love! – and all those literary and cultural references. Early on there’s a mention that Anatolii’s literary agent says there’s no need to invent books like 1984 because we have reality. Fine. But I thought the balance in Paranoia tilted far more heavily toward references to brands and reams of other authors’ work, e.g. 1984, than toward an account of reality, despite Martinovich’s vivid descriptions of present-day Minsk and all the surveillance. I don’t care about the “reality-antiutopia” balance but I thought the references loaded the book down and made it feel derivative, even as its final third sucked me in because I wanted to learn Anatolii’s fate… then the end reminded me of Mikhail Elizarov’s Librarian finale. I realize this may be a personal problem: I don’t know if Martinovoich has read The Librarian or 2017 or some of the other books I felt traces of in Paranoia. I’m probably just catching a lot of zeitgeist in all the contemporary Russian novels I read; many contain elements of fantasy and/or dystopia. Unfortunately, Paranoia always seemed to remind me of other books instead of announcing itself as a unique novel called Paranoia. I’m especially sorry to report that because the book is generally quite readable, with good material. I think it’s more important as a political statement about Belarus than as a literary work, though it left me feeling a little empty, without new or unusual insights into totalitarianism or paranoia itself. Of course the banality of totalitarianism and paranoia might be part of Martinovich’s point, but I don’t think that makes the book feel any deeper or less muddled. -The New York Review of Books ran an article-review by Timothy Snyder. -The first 30 pages of Paranoia are online in PDF form here. -Reader reactions have been positive on Ozon (here) but less so on TextExpert (here), where I concur with commenter Afineja’s thoughts: Paranoia needed more editing but is worth reading. The beginning of the TextExpert review piece seems to provide a clue to the editing problem: reviewer KoLibri refers to a Martinovich blog post (here) in which Martinovich says he thought about the book for a year and a half, then wrote it in a month and a half, writing a large portion on a Nokia qwerty keyboard. Level for nonnative readers of Russian: 3.5 out of 5.0, moderately difficult at times, with lots of metaphor, references, and odd speech. 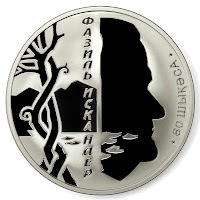 Up next: Iskander’s stories about Chik or Mikhail Gigolashvili’s Толмач, which I think I’ll call The Interpreter. Photo credit: Lhoon, Ilmari Karonen, via Wikipedia. 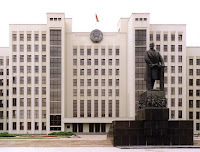 Government building in Minsk.